You know I a really hate to admit this but I am new to the Robeez craze. I heard a lot about them but until now I didn't really understand the hysteria. My mom friends talked about Robeez like they were some sort of rock star not just a baby shoe. They come in an almost endless assortment of adorable colors and patterns. (We really want the blue guitars, shark, and trainers!) Not to mention my pediatrician almost had a heart attack he was so excited about them.. I had to listen to him for 15 minutes go on and on about how babies should be wearing soft soled shoes just like these and not those harder soled shoes you see most of the time. Thats not even the best part as far as a mom is concerned (ok possibly the foot part is..) but honestly I most appreciate the fact that no matter what Connor does or tries he cannot get them off!! HURRAH! Nothing erks me more than being out and realizing your son has one shoe and not two.. and you know you left the house with two.. SO WHERE IS THAT OTHER SHOE?? With Robeez thats no longer an issue and we always come home with both shoes and I'm not stuck searching for a rogue shoe in some random location..
Well until recently Moms who loved Robeez were sort of out of luck when it came to outdoor wear as the classic Robeez is a soft sole so they are not suitable for the great outdoors. Robeez Treds are a whole diffrent matter!The perfect blend of protection and flexibility your beloved Robeez can now venture outside. Ive been watching the sales since the day they launched and the response has been over whelming with many styles still selling out! My favorite part is not only do they come in a great assortment of cute styles (We really want a pair of Evans!!) but they feature that same elastic that keeps them on little feet!! Run.. quick quick.. over to Robeez and check out their selection of soft soles and Robeez Treds!! If you like those you should try out joshoes www.joshoes.com I like them even better than robeez! 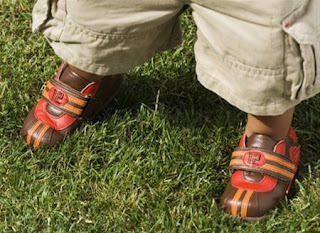 Awww....sometimes I miss itty bitty shoes like those! 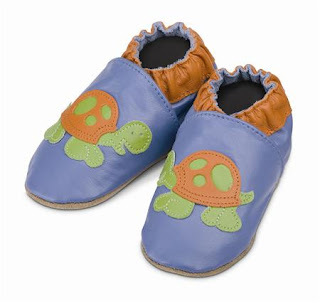 I think Rileyroos are still your best bet for soft sole baby shoes. They're precious!